Catskill 3500, #6 and #7. Hunter and Southwest Hunter (Levitt) Mountains. It was a chilly October. I went to work on Friday all packed up, and headed to the Catskills directly after work. I had reserved a spot at the Phoenicia Black Bear Campground and got there after dark. With my headlamp on, I quickly set up the Hilleberg Unna tent amongst the partying and county/western music sounds from neighboring campsites. It was a chilly night and got down to around freezing but I was comfortable in the Unna and a Sea to Summit Trek !! 18° bag. The next morning, I awoke to see that I was right next to Esopus Creek. I had no idea. It was quite a nice sight. Waking up next to Esopus Creek at the Phoenicia Black Bear Campground. I packed up and headed to the Spruceton DEC parking lot for Hunter Mountain. Arriving at the Hunter Mountain DEC parking lot. The trailhead and Register Box of the blue blazed Spruceton Trail. Meeting a couple other hikers on the way up to the summit of Hunter Mountain in upstate New York’s Catskill Mountain Range. The fire tower at the top of the Catskill’s Hunter Mountain. A beautiful view from the top of Hunter Mountain. Panoramic view from the fire tower at the top of Hunter Mountain. The Devil’s Acre shelter on Hunter Mountain. Little did I know, I just passed the herd path to the peak of Southwest Hunter Mountain. 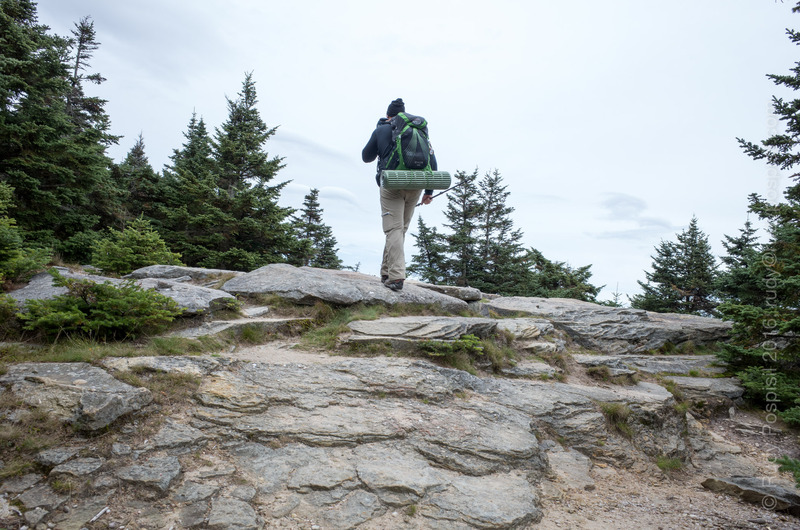 Let the bushwhacking to the peak of Southwest Hunter Mountain begin. I see the Southwest Hunter Mountain canister!!! Success! 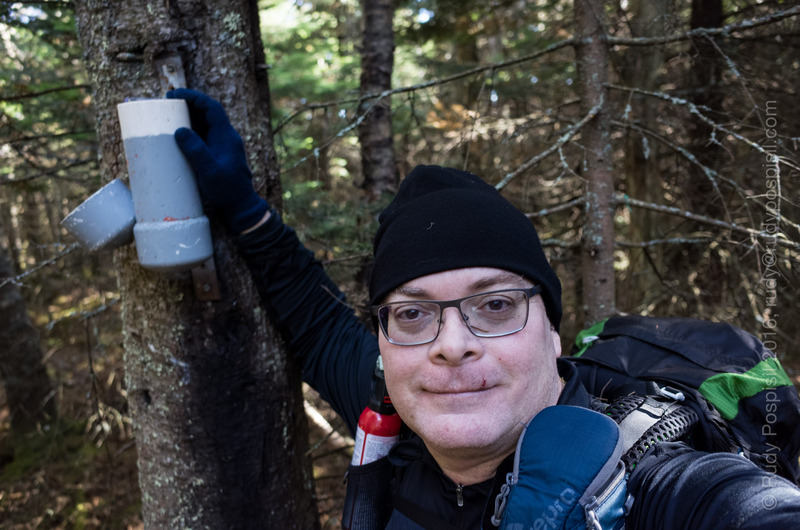 Finding the gray canister at the peak of Southwest Hunter Mountain (Levitt’s Peak). Bushwhacking back down to the Devil’s Path trail. Coming down, I stumbled upon an obvious herd path and realized that I took the very difficult way up. The Diamond Notch Falls as seen from the Diamond Notch trail as I headed back to the motorcycle. Heading back to Manhattan on the BMW R1200GS motorcycle. I had to pull over to view the full moon. The elevation graph of the round trip hike of Hunter Mountain and the bushwhack of Southwest Hunter Mountain in the Catskill Mountain Range in upstate New York. The Google Earth map of the round trip hike of Hunter Mountain and the bushwhack of Southwest Hunter Mountain in the Catskill Mountain Range in upstate New York. Packing up my Osprey Exos 38 for the overnight journey. The register box at the Slide Mountain trailhead. The obligatory selfie at the trail junction. The hike up is along a fairly smooth path albeit it long and quite steep at times. Stunning views on the way to the top. Officially hitting the summit of Slide Mountain. Google Earth map showing the path I took to the top of Slide Mountain. Garmin GPS Elevation Graph showing the Slide Mountain ascent.